On Wednesday 16th February 2011 CAMRA announced that the Harp in London’s Covent Garden had won the 2010/2011 National Pub of the Year Award. It is the first time that a London pub has won this award, and the Harp has beaten three other excellent pubs which made it to the final shortlist. Those who are familiar with the Harp will know that the award is well deserved – it’s a fine pub with a welcoming atmosphere and great real ales and ciders. The pub is very welcoming and is loved by regular customers and occasional visitors alike. 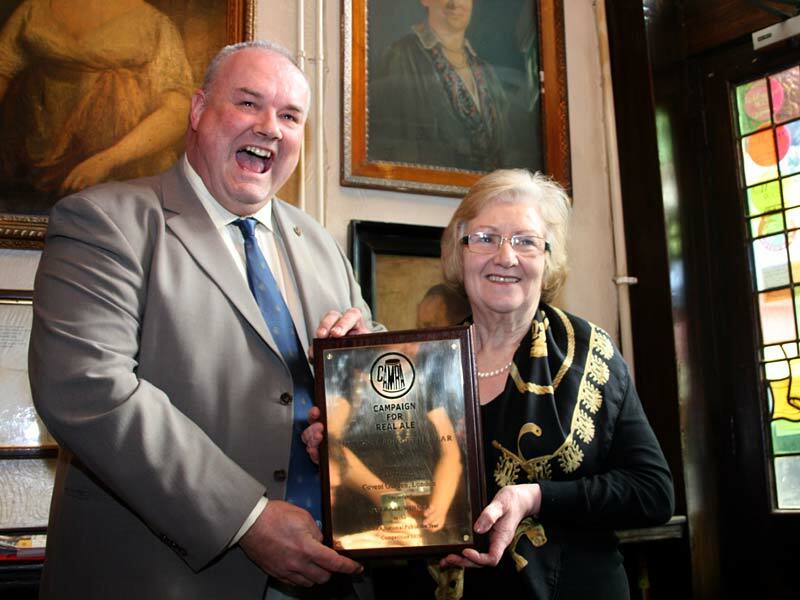 The presentation of the award to Bridget Walsh (Binnie to her friends) took place at lunchtime on the 16th and I was lucky enough to be invited along. The day got off to a good start with a quarter page write up in the printed version of the Guardian Newspaper (online version here). Other papers carried the story too and there was even a sentence in the Sun. Binnie was also interviewed by the breakfast team at BBC Radio London. I got to the Harp early and initially the pub was eerily quiet. Binnie was talking to a journalist from Asylum mag. By 11:15 the pub was its usual busy self, and all the CAMRA people had arrived. Julian Hough kicked off with a speech that culminated in a review of some of the comments that the CAMRA surveyors had made about the Harp. After receiving the award Binnie gave a short acceptance speech thanking the CAMRA members, the various breweries and her staff. Once the formalities were out the way it was time for a drink. 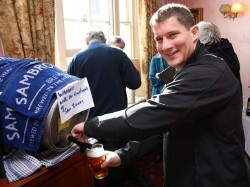 Both Sambrooks and Dark Star breweries had generously donated a cask each for the day – Wandle and Hophead respectively. Mmm, decisions, decisions… Duncan Sambrook (MD of Sambrooks) had no doubts and led the attck on the Wandle. In the end I had some of both – very nice. Some excellent food was provided by a team from the First Step Trust. 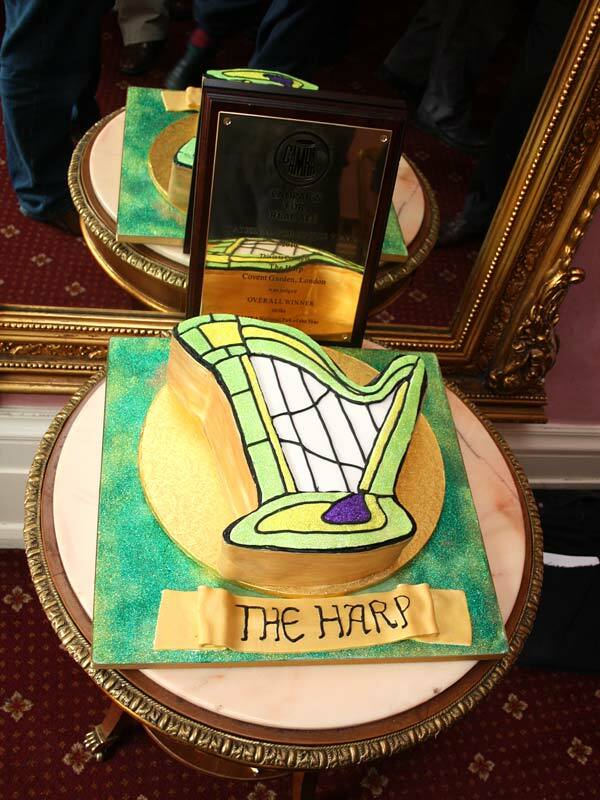 There was also a superb cake made by Siobhan Fitzpatrick – shaped like a Harp (the cake, not Siobhan) to represent the beautiful stained glass windows at the front of the pub. After Binnie had cut the cake we all realised how tasty it was. It was easy to spot who’d eaten some as the green glitter on the icing tended to stick to your face. After several rounds of the Hophead vs Wandle taste test I plumped for the Wandle but only just. If you’re ever thirsty in the Covent Garden area I recommend a detour to The Harp – you won’t regret it. Thanks to the Harp for inviting me and for allowing me to use some of their photos – you can see more on their Facebook album page. I think I recognise some of my pix. The Harp is my local, and I started dropping in the winter of 2003, and never looked back. When growing up locally in the early ’70s it was a market dive and we never went in. A magnificent change for the best – one of what I’d say are maybe a handful of local pubs in the Garden. Dominic, do you mean the paintings on the wall?